Minnesota, with 87 Counties and 11 Reservations, is a very diverse state both geographically and culturally. In order to connect with intercessors in every area of our state we have divided it into 4 parts with a Leader appointed to each section. East Central Quad which includes Twin Cities metro and surrounding area. 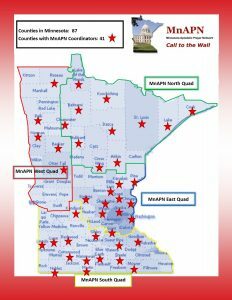 We are continuing to build a network of county coordinators in each county in Minnesota, so names will be added periodically as we fill those positions. Click Here to contact your county coordinator!